NASA Earth Observatory images by Robert Simmon, using Landsat 8 data from the USGS Earth Explorer. Caption by Holli Riebeek. Rounded mountains are a common theme in Chinese art. Mountains were considered sacred in Chinese culture, and mountain caves and grottoes were seen as gateways to another realm of harmony. Such beliefs were no doubt influenced by the karst geology that covers some 13 percent of eastern and southeastern Asia. In person, the mountains look as charmingly unreal as they are depicted in art. From above, however, the roundness that characterizes the mountains isn’t visible apart from the dark shadows the peaks cast. Instead, the dominant patterns are long lines, which are fractures or joints running through the rock and the channels carved by running water. These features speak to the forces that shaped this landscape. A karst landscape is carved by water, both above and below ground, mostly in carbonate bedrock. Water seeps into the ground through cracks or joints, hollows out caves or canyons, and then reappears as springs. Caves, sinkholes, gorges, sinking streams, natural bridges, rock outcrops, and natural springs are all characteristic features of karst landscapes. The mountains found in Guangxi Province are perhaps the best example of a mature karst landscape called cone karst. Such a landscape was able to form because a deep layer of limestone and dolomite bedrock covers broad sections of southeastern China. At the same time, the region receives abundant rain, which dissolves the bedrock easily. One theory for the formations in southeastern China says that caves formed and collapsed near the surface, creating pits separated by pillars of rock. 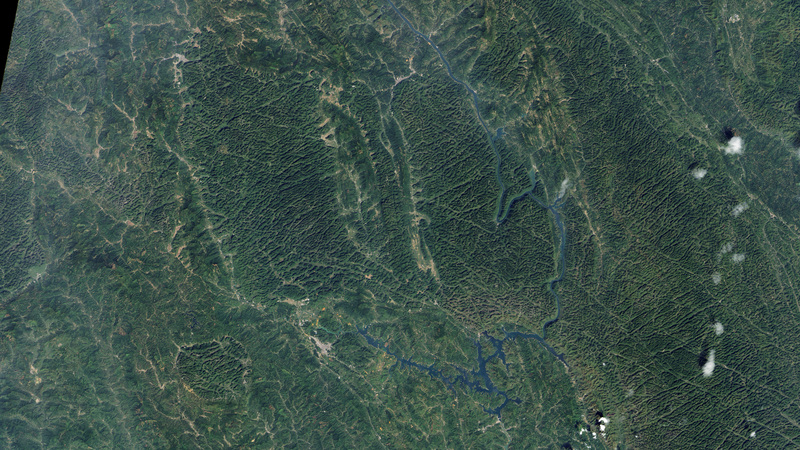 Surface streams and weathering further refined the pillars into the rounded Guangxi Mountains. International Union for Conservation of Nature (2008) World Heritage caves and karst. Accessed May 2, 2014. Kentucky Geological Survey Karst is a landscape. Accessed May 2, 2014. Metropolitan Museum of Art Nature in Chinese culture. Accessed May 1, 2014. 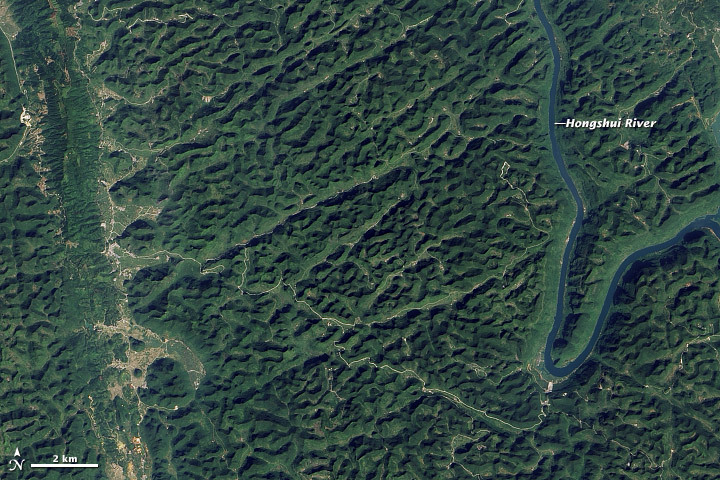 NASA Jet Propulsion Laboratory (2014, April 28) Karst landscape: China. Accessed May 2, 2014. The University of Auckland Karst. Accessed May 1, 2014. The University of Western Ontario Stolen land: Famous erosional landforms. Accessed May 2, 2014. U.S. Geological Survey What is karst? Accessed May 1, 2014. Virtual Cave (2013, January 16) Karst. Accessed May 2, 2014.